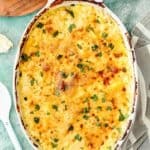 This Cheesy Potatoes and Cod Casserole recipe is cheesy, creamy, and easy to make! Loaded Potato, cheese and cod, this dish is a whole dinner in one! For sure a go-to dinner for any day of the week. Place cod in a medium saucepan and cover with fresh water. Bring to a gentle simmer over medium-low heat. Cook the cod until it flakes easily when poked with a fork, 10 to 12 minutes. Transfer the cod to a plate and let it cool enough to handle, then shred it. If the cod has skin and or bones, remove them. Set aside. Preheat the oven to 400º Fahrenheit(200°Celsius). Butter a baking dish. I used an oval casserole baking dish (1.5 Qt.). Combine all ingredients of the sauce in a microwave-safe cup or bowl. Place cup in the microwave and heat until the butter is melted, and the mixture is warm, about 2 – 3, 30-second bursts. Set aside. Add 1/3 of the cream mixture on the bottom of the dish. Spread about 1/3 of the potato slices into the bottom of the prepared baking dish. Top with half of the flaked cod and then top the fish with cheese. Repeat one more time, finishing with one more layer of potatoes and the remaining cream mixture. Cover loosely with foil and bake for 45 – 60 minutes, or until the potatoes are fork tender. Remove from oven, sprinkle with parmesan cheese, and bake without foil for 10 minutes or until golden. Let it rest for 5 minutes before serving. Garnish with chopped parsley, if desired. Serve hot. Cod can be found in most fish markets. I usually buy it at my local Asian store, which sells tons of fresh fish. You can also find it in Italian markets (baccalà), Spanish markets (bacalao) or Portuguese markets (bacalhau). It comes fresh (unsalted) or dried and salted. I like to use fresh cod for this recipe. If fresh cod is not available, you can also use haddock. Potatoes: The best to use are Russet or Yukon potatoes. Slice the potatoes into about ⅛-inch (3 mm) thick slices. Cream Mixture: warming the cream mixture in the microwave before putting the dish in the oven reduces the chance that the mixture curdles. Make ahead: Prepare the potatoes up to the point of baking (but do not bake) and refrigerate, covered, up to two days in advance. Just bake the scalloped potatoes and let them cool completely to room temperature. Then, cover tightly and refrigerate for up to 3 days. You can then bake covered (with foil) at 350° Fahrenheit for 30 minutes, or until warmed through. Can you freeze this recipe? Unfortunately, I don’t recommend it. Neither the potatoes nor cream sauce freezes well.